In this dark age of dead ends, here is a bold, urgent initiative. 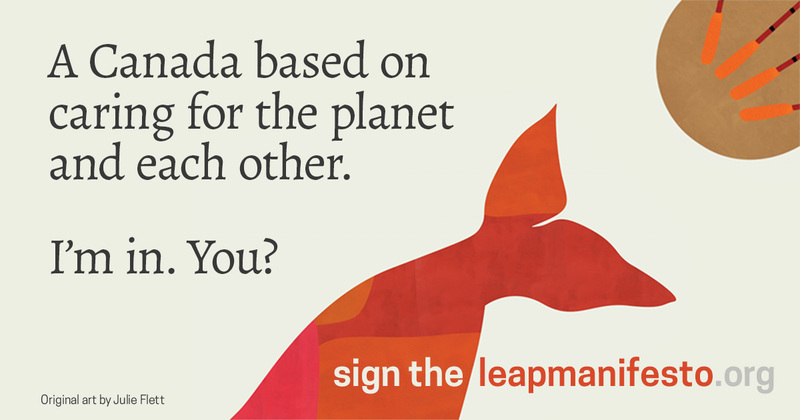 The leap manifesto offers real grounds for real hope. Not the fast-food Hope marketed by cynical politicians, but the real thing, deeply transformative, built by all of us with open eyes, compassion, imagination, and yes, hard work. Please leap in. And pass it on. Categories: Bold Scientists, Campaigns, Climate change, Climate disruption, Conservation, Current affairs, Ecology, Economic, elections, Energy, Environment, Ethics, First Nations, Global warming, Government policy, Justice, nonviolent resistance, Oil sands & shale gas, Protest, Resistance, Science, Sustainability, Uncategorized, Water | Tags: Bold Scientists, Canadian government, climate change, climate disruption, corporate agenda, ecological agriculture, environmental justice, Ethics, First Nations, fracking, freshwater, global warming, mining, nature, oil tankers, pipelines, post-oil, renewable energy, resistance, science, Tar sands, United Nations Declaration on the Rights of Indigenous Peoples, universal basic annual income | Permalink.